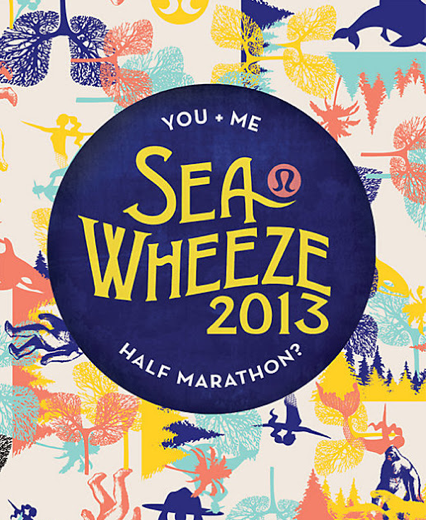 The Sea Wheeze 2013 poster has been released in the Lululemon Love Notes section of the website. I’m really loving the blues and yellow (Burning Yellow like the newest Speed Shorts? ), but I’m not fond of the salmony fleshy pink for garments. I also really like the retro 70’s feel of the images with the Sasquatch and the little mountie hat on the bottom, and the retro vintage circus typography. I really hope the 2013 Sea Wheeze gear incorporates these wonderful illustrations in the run gear as well as the date and race written on them. The Sea Wheeze 2012 gear in retrospect really wasn’t all that special so I probably wont go crazy hunting gear down for 2013 unless it’s specifically Sea Wheeze. Yup, I’ll definitely be running this again. I haven’t really run since the last race because I’ve been way more interested in Crossfit but I think I’ll start up the running in January.